When I saw that Bloodstained: Ritual of the Night got delayed into 2018, I began to worry about legendary Castlevania producer Koji Igarashi’s latest project. After all, it wouldn’t be the first time that a major crowdfunded title, especially one that was pitched upon gamer nostalgia, ended up being a disappointing product. A disastrous release would not only be a bummer for Metroidvania fans, but also a major blow to crowdfunding in general. I’m not worried anymore, though. It only took a 20-minute demo of Bloodstained to make me feel pretty darn silly about having any doubts, as I walked away very impressed with IGA’s passion project. Not only does Ritual of the Night manage to capture the tight gameplay that made me fall in love with Castlevania games, it also has its own mechanics and aspirations. This isn’t a mere nostalgia play, but a game that is aiming to be the best that the genre has to offer. The initial part of the demo walked me through all of Miriam’s abilities as I worked my way through a castle setting. After learning how to jump and use my short sword to destroy enemies, it started showing off more advanced maneuvers such as spell casting. This is actually done in a pretty interesting way, as it has the player using the right analog stick to aim where their attack will go. This essentially blends the action between a standard 2D action game and a dual-stick shooter. As I got more familiar with the action, I started to play around with Miriam’s moves. One particularly cool ability she has is a a downward kick (which is done after leaping into the air) that’ll then propel her to a higher height than she was before. This is a great way to get to otherwise inaccessible areas, and there were some areas that I could stay airborne for several seconds at a time. I assume there’s even more intricacies to the core combat that I haven’t learned yet, but I walked away very satisfied with how agile she was. As I was defeating foes and progressing through the castle, I began to pick up a number of different weapons I could use. While I dug the default sword a lot, I figured it would be best for preview purposes to check out the other weapons. Each one I tested required me to attack in a different manner, as the whip went slightly downward, and the long sword required a lengthy wind up (but did a ton of damage). I really enjoyed how much each weapon will impact how the player approaches combat, and it made me really think about what I was doing. For the most part, I used a fireball-type magic to take down bigger enemies. These attacks took mana to cast, but I was getting enough back to where I wasn’t really needing to balance it. Typically, one hit with magic and then a few strikes with my short sword was enough to take down any baddie that was dumb enough to get in front of my blade. The only time I started to run out of my magic was when I used it a ton during the demo’s boss fight. The boss fight I got to check out was the same one that was featured in the recent E3 trailer (embedded above) for Bloodstained. It had me dodging a bunch of bloody-looking attacks, hiding under umbrellas to avoid damage, and learning the boss’ different attack patterns. Some of the patterns require precise movement by the player, but thankfully Ritual of the Night is up to the task. I never felt as if the controls were too floaty, and if I got hit by an attack it was because I screwed up. I managed to beat the final boss (and the stage) without dying a single time, but I did have to pop a bunch of potions near the end of the battle. It ended up being a satisfying battle that really tested my abilities. 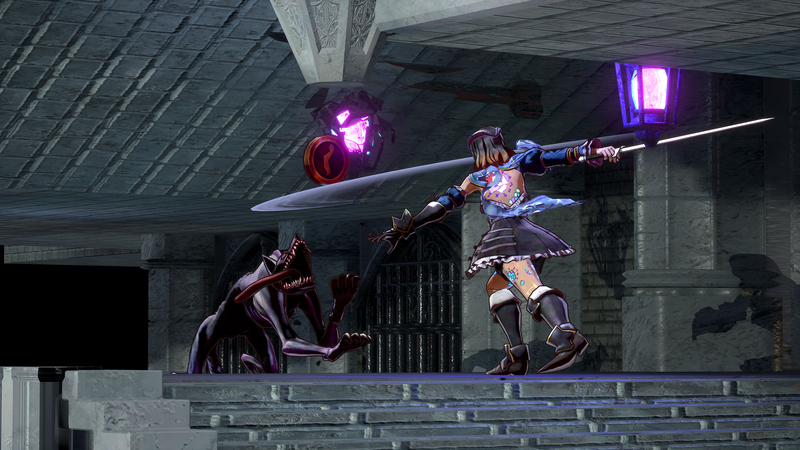 If all of the boss fights in Bloodstained are this fun to play, and continue to have such unique attack patterns, then we’ll be in for something really special. I came into my demo of Bloodstain: Ritual of the Night with some reservations about the crowdfunded title, but all of those fears melted away after I got my hands on it. This is IGA and Inti Creates doing what they do best, which is creating satisfying combat with all of the proper hooks of a Metroidvania title. I’m looking forward to seeing how the game will evolve, as I’m sure the demo only touched on the surface of what is available, but so far it’s looking extremely promising. Bloodstained: Ritual of the Night is set for a 2018 release on PlayStation 4, Vita, Nintendo Switch, Xbox One and PC. Previewed on PC.